Currently Share and Like buttons are the most popular tools in socializing and popularising online web contents. 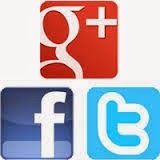 Facebook, Google and Twitter are considered as the best among the Social networking websites. They provide various widgets which can be used to deliver the latest contents on the web to thousands of followers around the globe. Here is the integrated code for Facebook share and like buttons, google plusone and Twitter tweet button. The Twitter Share / Tweet button is a small widget from twitter which allows users to easily share a website with their followers. Share your web contents with FB share button -: It allows facebook users to share a web content to Facebook, share with particular friends or with a group. Alternatively, they can share in a private message. Popularise Your web contents with FB Like button : - FB Like button is the quickest way for people to share content with their friends. It allows FB users to share pages and content from your site back to their Facebook profile with one click, so all their friends can read them. Add google +1 button to allow Your website visitors to recommend Your web contents to google search as well as to share it on the google Plus pages.